Courtesy: ‘The Barkley Marathons: The Race That Eats Its Young’In Frozen Head State Park, runners from around the world line up before the Barkley Marathons co­founder, Lazarus Lake. 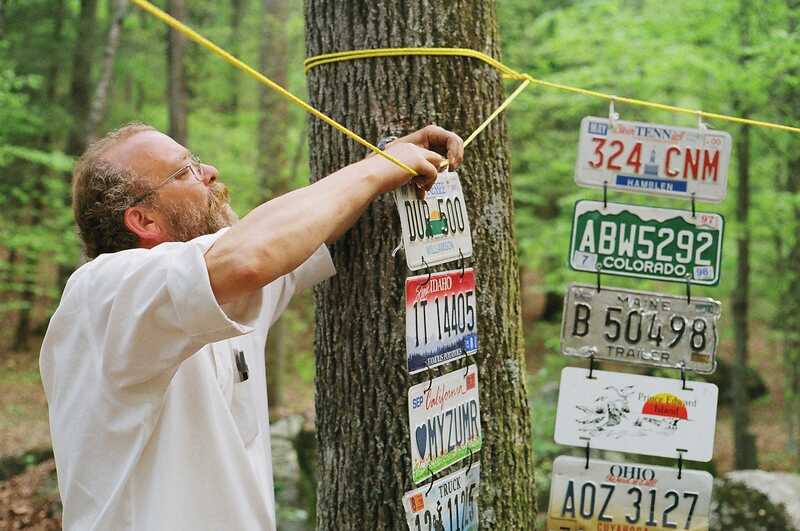 The Barkley Marathons is a mysterious ultramarathon held every year in a state park in Eastern Tennessee. Runners have to complete five loops of a 20-mile course that most say is really 26 miles, making the race somewhere between 100 and 130 miles in total. The elevation and descent in the race mean that finishers do the equivalent of climbing and descending Everest twice. Since 1989, only 15 people have finished the race. For a runner who tries to enter the Barkley Marathons, one thing is certain: they have almost no chance of finishing. The first Barkley race was held in 1986, but the course distance was bumped up to at least 100 miles – probably 130 miles, depending on who you ask – in 1989. Since then, there have only been 15 finishers. If ultramarathons are about testing human limits, a race like Barkley is about confronting the point at which people fail while facing those limits – or redefining success and failure entirely. Each of the race’s five “20-mile” loops are really more like 26 miles, according to most. And the elevation changes throughout the course mean that finishers experience a total of 120,000 feet of elevation change – the equivalent of climbing and descending Everest twice, according to a 2014 documentary called “The Barkley Marathons: The Race that Eats its Young“. Robbins got close to becoming the 16th finisher of the Barkley race last year, but he arrived at the finish six seconds too late – to be considered a finisher, runners must complete the race in 60 hours or less. Upon arrival, Robbins realised he’d skipped two miles of the course anyway. Despite these hellish challenges, something draws runners to Tennessee year after year to endure as much as they can and almost certainly fail. Hundreds apply ever year, including the winners of other races that are considered to be among the most difficult in the world, like the Hardrock 100. About 40 people receive a “condolences” letter telling them they have been accepted into the race. Amelia Boone, who works as an attorney for Apple, is a three-time champion of the World’s Toughest Mudder competition and a Spartan Race World Champion. When Boone got her condolences to compete in the 2018 Barkley Marathons, she was totally surprised – she thought acceptances had already gone out. Boone, who’d been getting back into racing after a broken femur in 2016, wanted to become the first woman to complete the Barkley. ReebokAmelia Boone in a different competition. No official information about the Barkley marathons is published or publicly distributed. There’s no website, since nothing about the race is supposed to be easy – including figuring out how to enter, a process that’s kept secret. 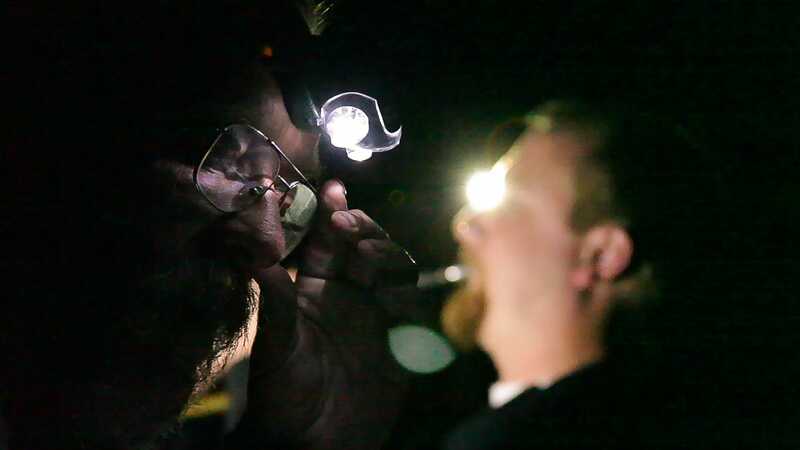 The creators of the Barkley Marathons, Gary Cantrell (who goes by the name Lazarus Lake or just Laz) and Karl Henn (who goes by Raw Dog), intentionally designed it to be surrounded by secrets. Most of the information prospective racers have comes from accounts by previous runners, of which thereare plenty online. Ultrarunner Matt Mahoney, who has attempted the Barkley 15 times but never finished, explains on his website that if someone wants to enter, they must get a person who has run the race before to reveal which day of the year to send an application to Cantrell. First timers like Boone need to submit some sort of essay explaining why they should be allowed to run. According to reports, once a Barkley “virgin” gets accepted, the entry fee consists of $US1.60 and a licence plate from their home state or country. 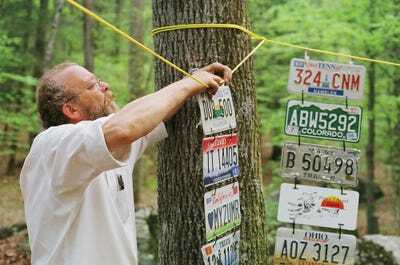 Courtesy: ‘The Barkley Marathons: The Race That Eats Its Young’Lazarus Lake, Co­Founder of The Barkley Marathons, hangs one of the required entry items, a licence plate from the runner’s home state or country. Rumour has it that at least one entry spot each year is cruelly reserved for a “sacrificial virgin” who has even less chance of finishing than the rest. People who have attempted the run the race before reportedly return for subsequent attempts with a shirt or some socks for Cantrell as their entry fee. The hills of Frozen Head have long been renowned for their difficulty. In 1977, James Earl Ray, the man who assassinated Martin Luther King Jr., broke out of Brushy Mountain State Penitentiary. Unlike the prison walls that hadn’t contained him, the surrounding terrain did: bloodhounds found Ray hidden under leaves 54 hours later, just eight miles from the prison. Cantrell, who was an ultrarunner in Tennessee before the sport became as popular as it is now, explained in the “The Barkley Marathons” documentary that he heard about Ray’s story, and thought he could cover 100 miles in the time Ray travelled eight. So Cantrell decided to create a race through Frozen Head State Park. The theoretically 20-mile course loop runs through terrain features that Cantrell and others have given nicknames like Rat Jaw, Testicle Spectacle, and Checkmate Hill. The course changes every year. While there are some trails through the park, at least two thirds of the course is off trail, so it requires serious scrambles and occasional climbing. “Only at the Barkley are you as likely to experience an upper body injury as you are a lower body injury,” Robbins wrote in a race report. In the mountainous area, weather can also be capricious, with intense winds, hail, snow, ice, and more. “If you’re going to face a real challenge, it has to be a real challenge – you can’t accomplish anything without the possibility of failure,” Cantrell said the documentary. Boone said there was a kind of unwritten rule that nobody talked about the Barkley Marathons in the lead-up to the race. She did know, however, that she’d need to practice using a compass and a map and going up and down a lot of hills. Courtesy: ‘The Barkley Marathons: The Race That Eats Its Young’Ultrarunner Jared Campbell clings to a tree while scaling “Danger Dave’s Climbing Wall,” one of the many challenging ascents in the course of the 2012 Barkley Marathons. No GPS devices of any kind are allowed on the race, nor are altimeters – just a map, compass, and a cheap Timex watch ticking towards the 60-hour time limit. Runners have to carry their own food, water, lights, and other necessities with them on the course. Depending on how much water they bring, they may wind up drinking from streams. Since there’s no official rule book, nothing tells runners what they should or shouldn’t do leading up to the race. But they’re informed that within Frozen Head State Park, racers are only allowed to train on the trails. That means participants can’t prepare for how rough the full experience will be. The day before the race, after runners have arrive at the camp in Frozen Head, they get to see the one official course map that denotes the route for the year. Racers have to copy the information from that map onto their own maps, marking elevation points and writing down the off-trail twists, turns, and climbs. Navigating the route depends on the racers’ ability to follow whatever directions they have marked on their maps. Then the runners wait to hear the sound of a conch being blown, which could come anytime between midnight and noon on race day. Once runners hear the conch, they have an hour to get ready to run. The Barkley Marathons officially begins when Cantrell lights up a cigarette. Once he lights the smoke (returning runners who have finished the race before bring Cantrell a pack of Camels as their entry fee), the runners are off. To ensure racers hit each point on the course, the organisers stash books throughout the route. Cantrell gives every runner a number before they start each loop, and when they find a book, the racers have to tear out the page that matches their number. But finding the books is no easy task, especially as foggy days turn into dark nights. When Boone arrived at the third book location on her second lap, she was with a group of four people. Another runner was already there, they found, and had been searching for the book for hours. Courtesy: ‘The Barkley Marathons: The Race That Eats Its Young’Barkley “virgin” John Fegyveresi runs past the decommissioned Brushy Mountain State Prison during the 2012 Barkley Marathons. For the first four loops, runners mostly work together, helping each other fight the course. The loops start and end at camp, which is the only place runners can receive aid, tape up blisters, replenish food supplies, and take a nap – if they have time. Each loop has to be finished within 13 hours and 20 minutes. Racers are supposed to do the route clockwise for the first two laps, then counterclockwise for the second two. When loop five comes around – if anyone makes it that far – the runner that’s in first place gets to choose which direction to run that loop. Subsequent runners (if there are any) then have to alternate, each going the opposite way of whoever came before. On that last lap, racers are trying to beat their competitors, the course, the clock, and their own exhaustion. 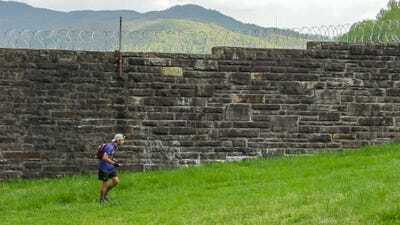 In the documentary, two runners – Brett Maune, a physicist who holds the Barkley speed record, and Jared Campbell, an engineer who has also won Hardrock – finished their fourth loop within a minute of each other. They both completed the race, but almost four hours apart. They’re the only two people who’ve finished the Barkley multiple times. That record-setting year – 2012 – was the first time the race had three finishers. Barkley virgin John Fegyveresi also made it to the end, with less than 20 minutes before the cut-off. Most runners, of course, don’t make it that far, often battling course conditions that are nearly impossible to outlast. The course record for slowest distance covered is held by retired computer scientist Dan Baglione, who got lost for 32 hours after covering just two miles of the course in 2006. In the middle of her second loop, Boone realised her group wouldn’t make it back to camp in time to start a third. She’d finished her first loop in 10 hours and 57 minutes, and bonus time gets rolled over according to race rules, but the 26:40 mark was inevitably going to pass before they made it back. Boone and her crew still finished the loop, even if it wouldn’t count. Out of 44 starters this year, Boone was one of just 21 people who even began the course’s second loop. Courtesy: ‘The Barkley Marathons: The Race That Eats Its Young’The tune Taps is played on a bugle every time a runner quits. In this nighttime image, Barkley co-founderLazarus Lake bows his head as crew member Dave Henn plays Taps. Contrary to the way it might seem, Cantrell has said he wants people to finish the race. For Boone, attempting Barkley was about remembering what got her into the racing in the first place – the fun of it. Before her broken femur (and a follow-up stress fracture), Boone said racing had started to become exclusively what adventure athletes call “type-two fun”: something that seems fun only when you look back at it, but not while you’re doing it. It was about running without being afraid to fail and having “type-one fun” – the kind you enjoy throughout an activity, not just in retrospect. Boone and every one of her fellow 2018 racers got a “DNF”: did not finish. “It didn’t feel like a DNF – it felt like a victory. A hard-fought victory, defeating the self-doubt demons I wrestled with leading up to the race,” she wrote in her report. Boone said she’d consider trying again. Those who do manage to finish get quite a prize: They don’t have to go out for another loop.